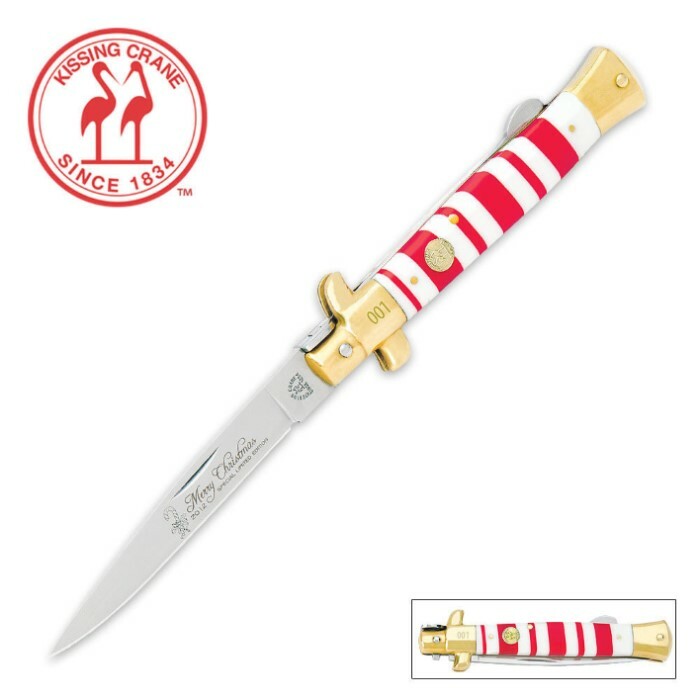 Kissing Crane 2012 Limited Edition Christmas Stiletto | BUDK.com - Knives & Swords At The Lowest Prices! This Kissing Crane® Special Limited Edition Christmas 2012 stilletto is sure to brighten your holiday! The red and white celluloid handle scales have been hand assembled with the utmost care. The 440 stainless steel blade is razor-sharp and the brilliant brass bolsters and Kissing Crane shield accent the handle with just the right amount of flash. Each knife has been laser-serialized on the bolster for collector appeal and the production has been strictly limited to only 600 worldwide! Don’t miss out on this tremendous opportunity to own a piece of Kissing Crane history. 4 3/4” cl.